CRUCIAL FOR mineral density, nerve transmission, blood sugar balance, blood pressure and hundreds of enzymatic reactions that help keep your body functioning. NO BUFFERS! Doctor’s Best doesn’t use Magnesium oxide because it’s a laxative and it’s known to not absorb well in the body. 100% CHELATED to optimize bio-availability for the body. You won’t waste your money with this product. Today is the day for you to take the first step to decrease your anxiety, restless leg syndrome, chronic fatigue, and migraines! DOCTOR’S BEST IS MADE WITH amino acids, L-Glycine and L-Lysine which provides easy and high absorption! Less work for your body making your body work more efficiently. MANY FORMS REQUIRE adequate stomach acid, this one does not. Plus, it’s cost effective without sacrificing quality. 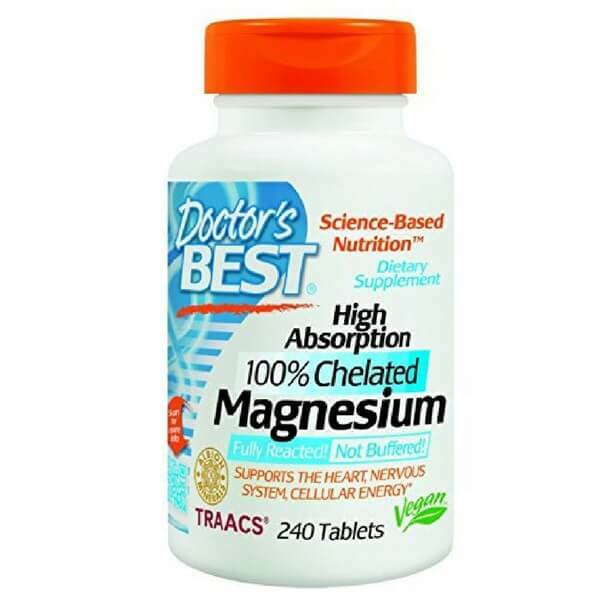 Doctor’s Best Magnesium is 100% true chelated magnesium which would explain why it seems to work so well. Other companies put magniesum oxide in it as a filler and this is an affordable and reputable company, so I will always stick with them! I wasn’t deficient, but I know it helps with cardiovascular health and muscle cramps. My muscle cramping has stopped, which is the worst in my feet if they are cold, they seem to get charlie horses, so that has stopped, thank god!!! I bought this for my husband, it helped stop what hubby thought was just “regular aches” from age… he continues to be very happy to know that magnesium is not only great for our heart, but also wonderful for our muscles and the rest of our cells as well. EVERYONE needs more magnesium. Do your homework and learn more about it, and you’ll feel better. Your heart and all your other muscles will thank you. Feed your cells. I take 1 – 100mg in the am and it doesn’t make me groggy. I also take about 1-100 mg of magnesium threonate capsules at night. There have been no digestive upsets nor any other unpleasant side effects. If you know that you need magnesium supplements, I highly recommend this brand! I dropped the meds from my migraine doctor to stay away from side effects. Mingraines occur due to vitamin issues within the body and hormone imbalance that can cause these vitamin issues. So, I was hoping this would work and II’m so happy to say that it’s been about two months and I am migraine-free! I used to get the migraine aura almost daily, even if it didn’t turn into a full-blown migraine. Now, I get no auras & no migraines. Plus, I fall asleep faster and am able to fall back asleep easier if I’m woken up in the middle of the night(typical for me). I take two tablets (400mg) each night about 30-60 minutes before bed. I started taking this for RLS and as a side note it has decreased my PMS mood swings and cramps big time. I use this to help me sleep at night, it took a month, but I SLEEP WONDERFUL. It’s been so long since I’ve had a great sleep schedule, especially with Lupus. NO BUFFERS! 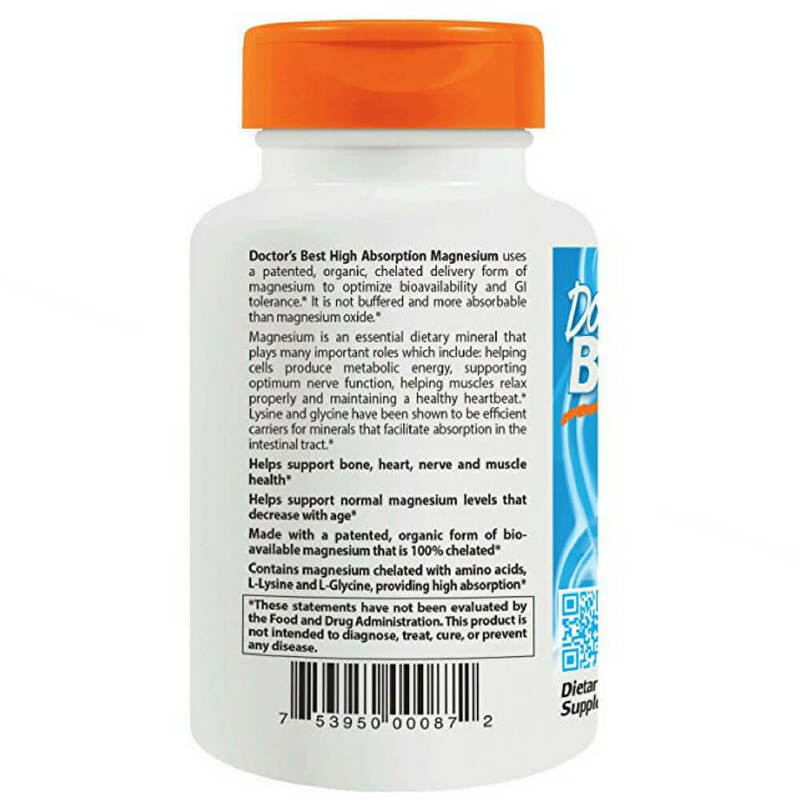 Doctor’s Best doesn’t use Magnesium oxide (laxative) and it’ known to not absorb well in the body. DOCTOR’S BEST IS MADE WITH amino acids, L-Glycine, and L-Lysine which provides easy and high absorption! Less work for your body making your body work more efficiently. Plus, it’s 100% chelated. What Does “not buffered” Mean That Is Found On The High Absorption Magnesium? Not buffered means they didn’t add more elemental magnesium to increase the value. Usually, most companies will do that as a buffer with magnesium oxide, which is known to not absorb well within the body. Also, it usually means that magnesium oxide has been “mixed in” with the magnesium bisglycinate. This makes the product cheaper but also less absorbed and useful, and unfortunately, companies often won’t mention whether or not they are using a “buffered” form. This would result in an overall lower level of bioavailability even if the milligram amount of elemental magnesium was higher. Magnesium ions have a positive electrical charge. Therefore, it functions as a mineral electrolyte which affects the amount of water in the body, the acidity of blood (pH), muscle function, and many other important processes. Magnesium works as a co-factor for over 300 enzymatic reactions in the body including all the reactions involving ATP, important for energy production and muscle contraction and relaxation. The magnesium glycinate/lysinate in High Absorption Magnesium with TRACCS® 100% Chelated is a genuine dipeptide chelate. Compared to other chelates, dipeptides have the ideal chemical attributes for optimum chelation and absorption. Why should I take High Absorption Magnesium with TRAACS® 100% Chelated? Doctor’s Best uses a patented, organic, chelated delivery form of magnesium that is 100% chelated to optimize bioavailability. Doctor’s Best High Absorption Magnesium is not buffered, meaning that is it not mixed with less expensive and less absorbable magnesium oxide. Inadequate magnesium negatively affects not only the heart, blood vessels, and bones, but may also impact blood sugar balance. Research has shown a link between magnesium and healthy blood pressure. A decrease in bone mineral density is associated with lower blood magnesium levels. How Does Doctor’s Best Product StandOut From The Rest?! Many forms require adequate stomach acid, this one does not. 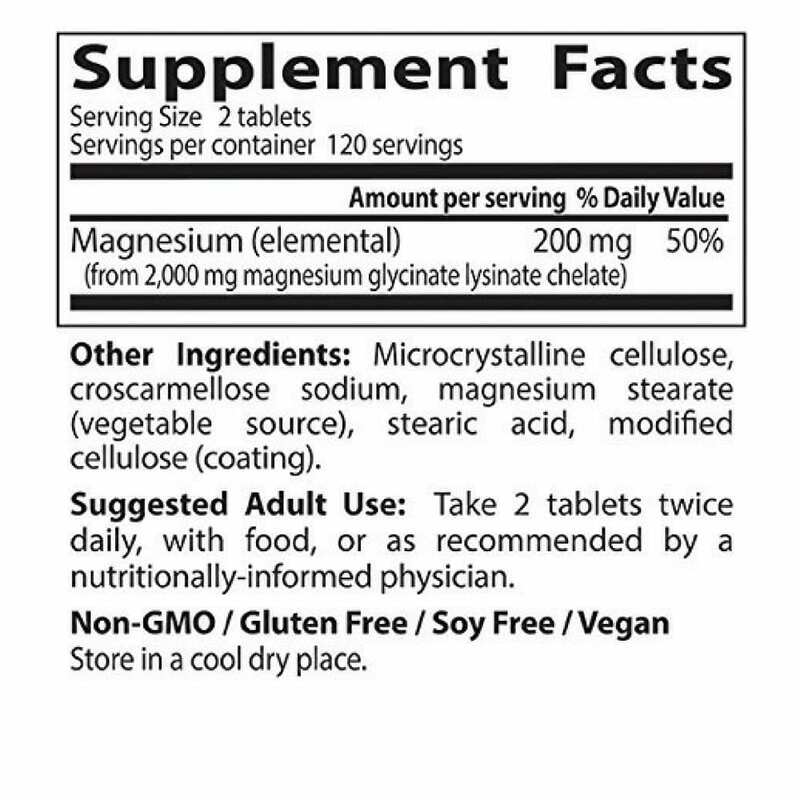 100mg ELEMENTAL magnesium per tablet. Many brands state the amount of magnesium glycinate/bisglycinate, but not the amount of absorbable elemental magnesium. Magnesium Bisglycinate unbuffered in a pure form has about 14% of ‘elemental’ magnesium. Bonded to Glycine for better absorption without GI discomfort. The bond is easily broken so the body can get to and use the magnesium. Some forms no matter how much you take, the body is barely able to break the bond and use it. Low metal rating as compared to other companies. Magnesium can’t just be by itself as a molecule, it has to be bound to something else to be stable. The biggest difference in different magnesium products is not from the magnesium itself (which is all the same) but from the molecule its bonded to. If you are taking your magnesium in a form where the bond is hard to break such as Magnesium Oxide, it will pass right through you. In other words, it’s a glue that holds the magnesium to its carrier, and if your body can’t break the bond, then you won’t absorb much if any. Magnesium Bisglycinate is bonded to Glycine which allows the Magnesium to more effectively pass through the intestine. This allows for maximum absorption of what you take without the digestive discomfort generally associated with Magnesium supplementation. The bond in this form is easily broken so the body can get to the magnesium and therefore makes a good option for a supplement. The other part – Glycine is a relaxant, so it can help with anxiety. What Helps Magnesium Absorption If I’m Low on Magnesium? Magnesium needs Vitamin B6 to enter the cell, and Vitamin B6 needs Magnesium, Zinc, and Vitamin B2 to convert to its active form. So, those low on magnesium might want to consider adding some P5P (the active form of B6 that won’t require conversion for the body to use). Boron enhances the body’s ability to use calcium, magnesium, as well as vitamin D and helps to prevent calcium and magnesium from being lost in the urine. Around 3mg per day will help if you don’t eat foods with boron regularly. Magnesium will detox cells so you might need to increase slowly if you have been low awhile. Those who are overweight may need more than those who are thin, as would those under constant stressors or have mercury filled dental amalgams. Caffeine and alcohol deplete magnesium, and wifi/emf/radio-frequencies do as well. There are plenty of decent magnesium supplements out there, but there are also some pretty mediocre and plain out crappy ones as well. The lowest end ones use Magnesium Oxide (gasp!) as the only source of magnesium in the product. WHY?! Then there are the magnesium chelates, of which most seem to be mixed with oxide as well. So, be careful with what companies you choose to use and read labels! What Is The Croscarmellose Sodium Excipient That Is Found In Several Of The Doctor’s Best Products? Croscarmellose sodium is a commonly used excipient in tablets. It is widely used in the pharmaceutical industry to help tablets break apart in the stomach. In simple terms, croscarmellose sodium is made of cellulose gum with a very small amount of sodium. The sodium content is less than a half a percent (less than 0.5%). Take two (2) tablets twice daily, or as recommended by a naturopath or functional medicine doctor. Magnesium (elemental) (from 2,000 mg magnesium glycinate lysinate chelate) 100 mg, Microcrystalline cellulose, croscarmellose sodium, magnesium stearate (vegetable source), stearic acid, modified cellulose (coating). Wouldn’t it be nice if you had muscle cramp relief, felt relaxed before bed, and had proper support for your cells to function better and faster? Order today!